where can I get the light on the pictures? The House of Troy light fixtures are plugged in behind a picture. The outlets were hard-wired to a switch. The cord was shortened so that it wasn't in the way. I wonder if I can get a similar look with my northern red oak floors This grain is lighter and sooooo beautiful and calm looking and that I was trying to achieve. I hope to "soften" the harsh grain look on my northern red oak floors. I suggest that you consult a local wood flooring contractor. You can try samples of gray and/or white pigmented stains to see if they mute some of the contrast in the red oak. I use this fixture often. Paint color - What is the gray paint color called? Hallway width - Just wondering what the width of this hallway is! How do you create a layout for a gallery wall? The issue of wall light is that sometimes it may not be totally necessary unless it has a specific lighting purposes. For example, using a wall light to light up a painting is a big plus. Where can I get those fabulous task lights? Pottery barn has gallery type lighting... not this exact style, but some great looking ones for this purpose. The Sheetrock details..Amazing! - The detail in the Sheetrock around the windows is spectacular. Any info about the detail would be greatly appreciated. Sheetrock is applied to furring strips and shaped plywood ribs to get the curve. At the ceiling, it's only one extra layer of sheetrock. Where did you get the baseboards in the picture? Thank you! 1. Family photos. Probably the most common use of a hallway is as a family portrait gallery. To really make a statement, consider using all black and white photos. 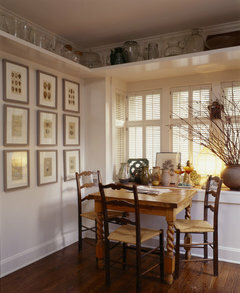 Or, if using color photographs, use all the same frame for a cohesive look. And, most important, don't forget lighting. Treat the area as a gallery and bring in some way to highlight the walls (see next picture for a perfect example of how to do this). Pangaea Interior Design, Portland, OR added this to Design Details: Moldings — or Not? The subtle, recessed area that goes up the wall and onto the ceiling is a very unusual way to give definition to each window in this hall. 3- Accent lighting - coming from light directed towards a specific art piece or photography. 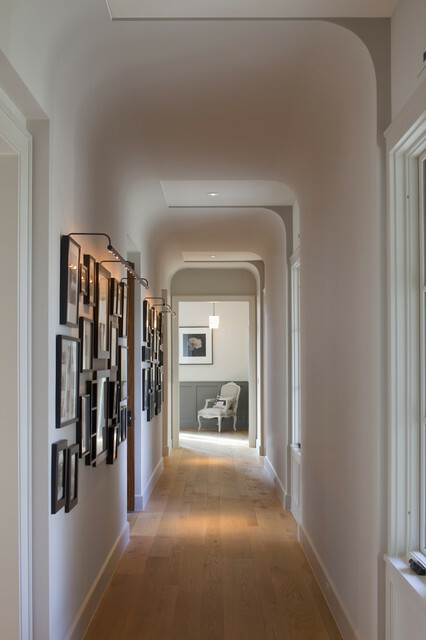 In this case the pictures are the focal point in this hallway. En långsmal hall behöver inte bli tråkig. Så fint!